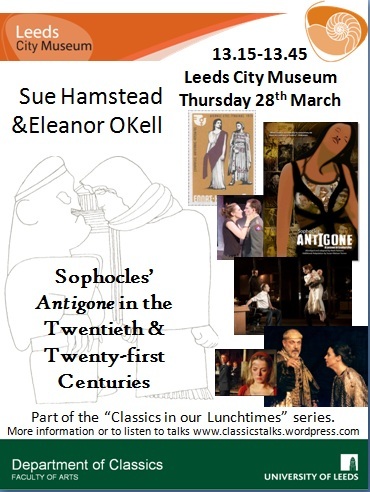 Sue Hamstead and Eleanor OKell will look at productions of (and inspired by) Sophocles’ Antigone to map the appeal of this tragedy in the twentieth and twenty-first centuries, considering the ways in which productions have brought out different meanings and related the tragedy to different issues and events at different times in recent history. The talk will include reference to a Leeds University production in May 2013, for which there will be a series of no-charge pre-performance talks at 7pm throughout the run. These talks will be put online through this website, as previous year’s talks have been. « “Hercules: a hero for all ages” – June 2013, join us in person or via podcast!